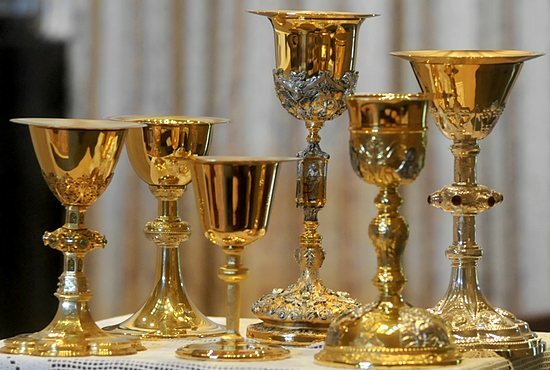 Father Barsness began his search for a chalice online, looking on Google to get a idea about prices. “On eBay, this one came up,” he said. “It’s a French, silver chalice. 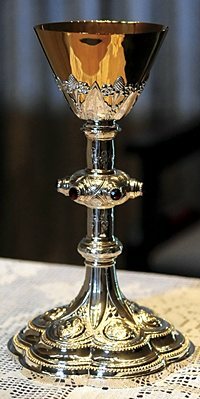 So, I bid, and I rescued it from eBay.” There are several symbols on the base of the chalice, including an ‘M’ for Mary, a cross and a flower, and it features glass stones. 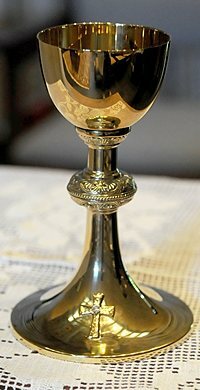 Father Kuharski said he received the inspiration for his chalice from the cathedral in Siena, Italy. “I was with one of our professors there, and he pointed out this great marble artwork on the floor,” Father Kuharski said. “It was an image of the sacrifice of Isaac and the angel grabbing Abraham’s arm. It was right before the steps leading up to the high altar. It’s in Scripture that ‘God himself will provide a lamb,’ and it just really struck me. 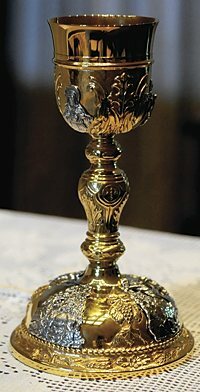 So I looked for a chalice that had the images.” He eventually had one made. The images on the base of the chalice include those from the story of Abraham and Isaac: Isaac carrying wood up the mountain foreshadowing the cross Christ carried up Calvary, as well as the scene of the sacrifice and the ram getting caught in the thicket. At the top of the chalice are images showing the fulfillment of the story in the New Testament: the lamb, the crucifixion and the Blessed Mother, the Immaculate Heart of Mary. 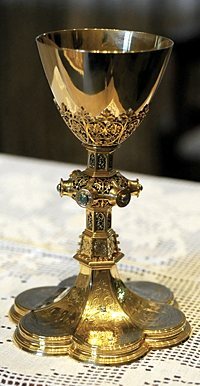 On the base of the chalice, made in Germany, is a crucifixion scene, with each tip of the cross featuring a diamond — the biggest one is likely from Father Eicher’s mother’s wedding ring, Father Shovelain said. On the bottom, there also are images of Matthew, Mark, the Blessed Mother, Luke and John.